Eryri, or the Snowdonia National Park has been a National Park since 1951. It is the second largest National park in England and Wales and includes some of the most beautiful and spectacular scenery in the British Isles. From dramatic coastlines through rolling foothills to dramatic mountains, Snowdonia has it all. It sounds like a cliché, but you really could be sailing in the morning and climbing a mountain in the afternoon. Snowdonia is also new widely hailed as the Adventure Capital of Europe, with many world-famous attractions for thrill seekers; from inland surfing at Surf Snowdonia to the world's fastest zip wire, to some of the UK's best downhill mountain bike tracks. The highest peak in England and Wales at 1,085m (3,560 feet). Snowdon forms the centrepiece of a dramatic upland range of rocky summits and the whole area is a magnet for outdoor enthusiasts and lovers of spectacular scenery. 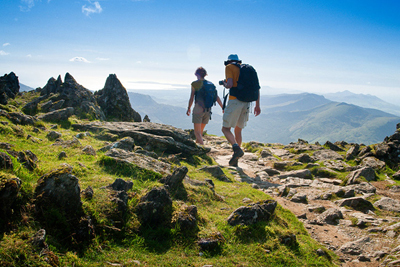 Several of the routes up Snowdon start near Beddgelert, for more information about walking and outdoor activities in Snowdonia please click here. A mile or so to the south of the village of Beddgelert the river Glaslyn forces a passage through the Aberglaslyn Pass. This rocky wooded area is one of Wales’ most famous beauty spots; and the Welsh Highland Railway which runs through the Aberglaslyn Pass takes full advantage of the spectacular scenery. A large wooded area managed by Natural Resources Wales, and a great venue for walking, biking, picnicking and camping. 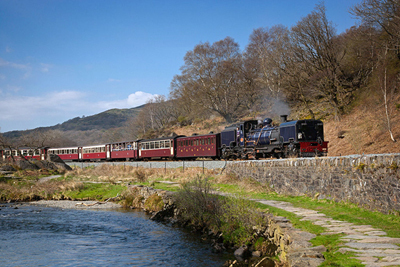 Llanberis is almost due-north of Beddgelert and the two villages are linked by a spectacular mountain pass. The area is popular with walkers and climbers and was in fact the training ground for the first successful British ascent of Everest. Pen-y-Pass, at the road’s summit, is the starting point for two popular walks to the top of Snowdon. This beautiful and peaceful valley cuts the mountains to the north-east of Beddgelert. The valley’s narrow floor is largely filled by two idyllic lakes, Llyn Dinas and Llyn Gwynant, along which are three campsites. The area is steeped in the Legends of King Arthur. As the A498 climbs the shoulder of Nant Gwynant there are panoramic views of the Snowdon and the neighbouring peaks. This pretty little village is located 3 ½ miles north of Beddgelert on the A4085. It stands close to the picturesque lake of Llyn Cwellyn. A popular path to the summit of Snowdon starts in the village.